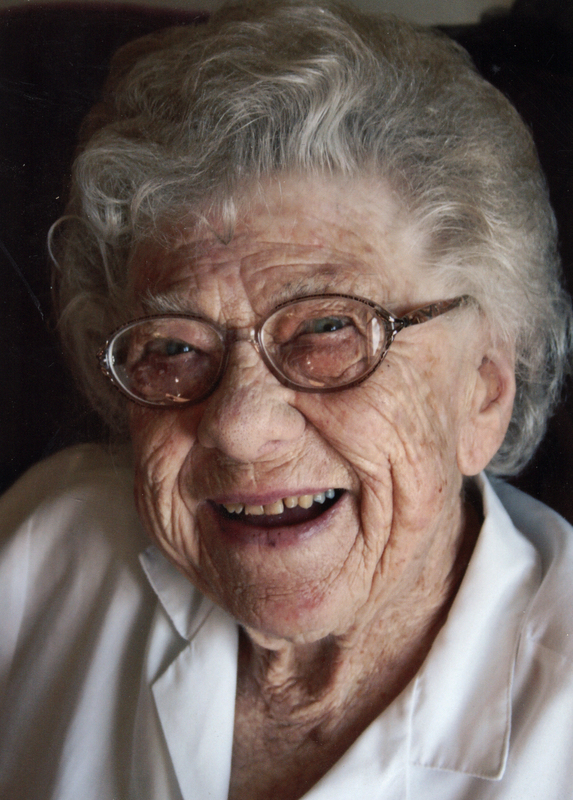 Funeral services for Edna Huber, 101, of Mobridge, will be held at 2 p.m. on Friday, Jan. 18, 2018, at Kesling Funeral Home. Burial will be in Mobridge City Cemetery under the direction of Kesling Funeral Home. Visitation will be from noon to 2 p.m., prior to the service. Edna passed away on Saturday, Jan. 12, 2019, at Sturgis Care Center. Edna E. Huber was born on Nov. 4, 1917, to Henry and Emelia (Aman) Schanzenbach in Akaska. Her family moved to the country near McLaughlin when she was young. She attended country school and rode her horse to get there. When she was 13, her family lived for one year in Elk Grove, Calif., where her dad worked in the orange groves during the depression. The rest of her life was spent in McLaughlin, Mobridge and the last year and a half in Sturgis. Edna was married to Gottlieb Stotz on June 24, 1937. This this union four children were born: Gene, Gloria, Valerie and Gary. Her second marriage, to George Huber, was on Jan. 31, 1970. Edna volunteered at the Mobridge Thrift Store for 35 years and was also the head of the Mobridge Kitchen Band for many years. She was an excellent cook and loved baking. Kuchen was her specialty. She enjoyed quilting and made quilts for all her children and grandchildren. She was very active in Seventh Day Adventist Church during her lifetime. Edna is survived by her three children, Gene (Mary) Stotz of Buhl, Idaho, Valerie (Bob) Larson of Littleton, Colo., and Gary (Peggy) Stotz of Rapid City; 16 grandchildren and 25 great-grandchildren; three stepsons and their families; and many nephews and nieces. Edna was preceded in death by her parents, Henry and Emelia Schanzenbach; husbands, Gottlieb Stotz and George Huber; daughter, Gloria Johnson; grandchildren, Tonie Eveland and Travis Johnson; and brothers, Melvin, Seth and Irvey.